Rome: City and Empire was an exhibition from the British Museum that captured the grandeur of the vast empire of ancient Rome and shared stories of everyday life, worship, war, glory and death, through more than 200 beautiful objects. Highlights included a gold and jasper sealstone ring depicting Mark Antony, an ancient carved marble head of a woman resembling Cleopatra and a Pompeii fresco. 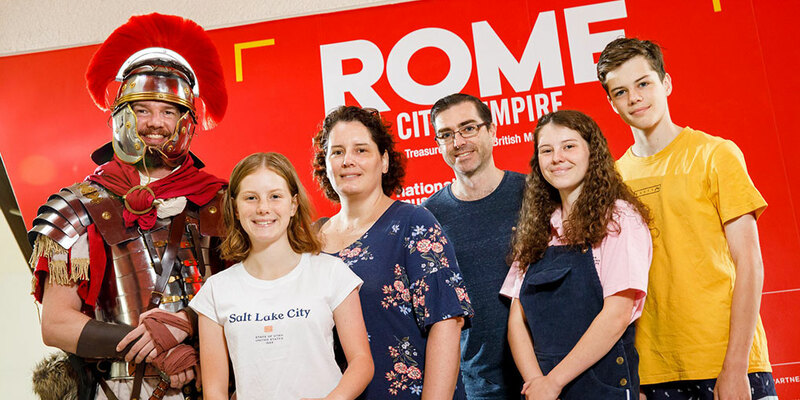 Celebrating 100,000 visits to Rome: City and Empire. Listen to our Rome exhibition audio tours, an ABC RN conversation with Richard Fidler and talks with Roman experts including curators, J Patrick Greene and Elizabeth Minchin. A must-have memento featuring all of the British Museum objects on show in Canberra for Rome: City and Empire plus an exclusive chapter about the influence of Ancient Rome on contemporary Australia. Discover behind-the-scenes insights into the development of exhibition elements including multi-sensory interactives, family activities and our audio tours. Congratulations to E Dimaano, ACT, who won the major prize of a Roman holiday. Thank you to everyone who visited and entered the competition.